This little dog looked quite comfortable in his seat on the bus. Other noteworthy features of my bus ride – the bus driver liked to sing and make up little jingles about each stop. He was in good spirits. I wondered if he were a bit high on marijuana or some such, but no he was just making his job more interesting. I wanted to sing in reply but none of the other passengers showed any inclination to do so. Maybe the little dog should have started howling! What better thing to do than to examine your friend’s Pokemon card collection? An orderly procession onto the bus. Goodbye – the 3 Pokemon enthusiasts are sitting all together there in the front seat. Going downtown is a serious matter. I don’t go by bus very often but today was the day to venture forth. Fortunately I had done it about a month ago and that day by sheer coincidence I met James my son at the bus stop. It was equally rare for him to be traveling downtown by bus early in the morning. But he could make sure we took the express bus and that I got off at the right stop. I have to walk 4+ blocks to get to the bus stop. This is a 5-10 minute walk from my house. This morning a bus pulled up just a minute or so after I arrived at the bus stop. Just as I was ready to pay I asked if this was an express. No, the driver replied. The express will be along in 6 minutes. So I hopped off – and nearly got hit by a cyclist speeding down the sidewalk. A nasty accident narrowly avoided. The cyclist not expecting anyone to be getting off the bus – and me not expecting a cyclist on the sidewalk. The express bus duly arrived a few moments later. 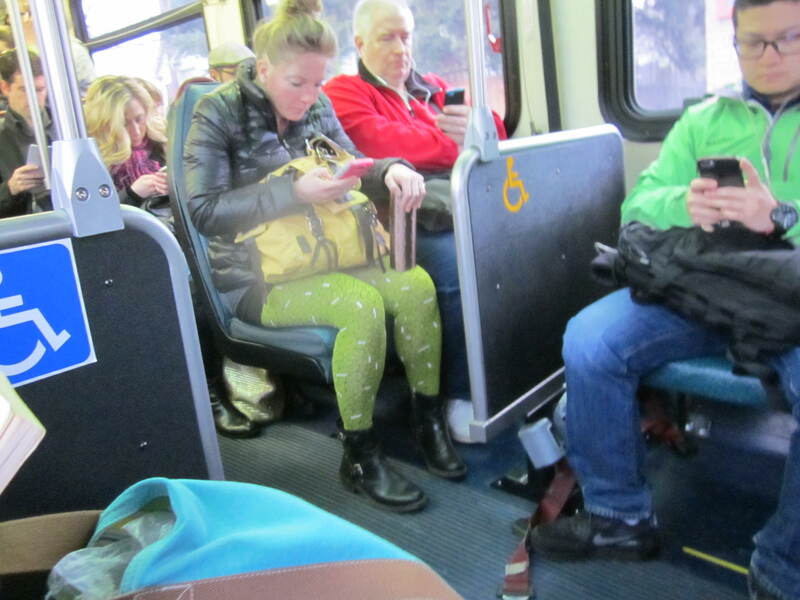 The bus filled up with commuters – all seriously glued to their electronic devises. My pair of trousers particularly caught my eye bright bright green, the photograph doesn’t do them justice – I wonder where she worked. Doesn’t she look as if she should be knitting?